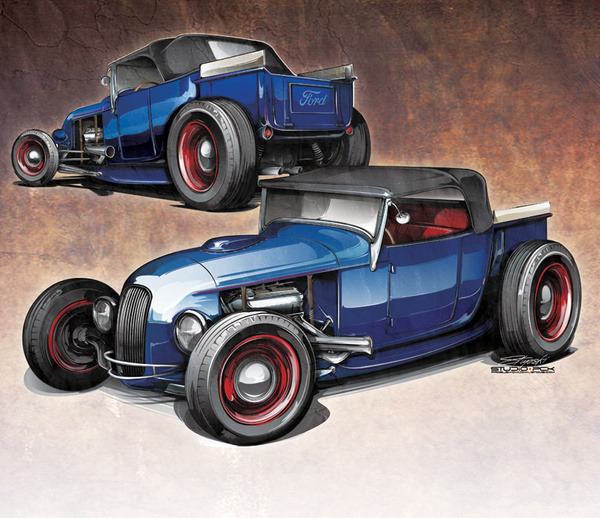 Hot rod design rendering by Problem Child Kustoms for the 2010 Street Rodder Magazine Road Tour Car. 2010 Street Rodder Road Tour Car rendering.... Styled with a nod to the Bay Area local, 1952 AMBR winner, and a tribute to the build shop's home region. Track nosed, extended-body T pickup on deuce rails. Grab a copy of the magazine, and check it out as it nears completion and hits the road! Illustrator art, starting with pencil roughs. Post-production work with Iwata Custom Micron, ink, pen and guache.